It’s essential for core dividend holdings to consistently raise their payouts over time. Without a steady uptick in the regular dole, inflation starts gnawing into investors’ returns. That dollar becomes 98 cents, becomes 96 cents, and – you get the picture. And it’s especially important to keep tabs on the dividend growth of your real estate investment trusts (REITs). I want to buy REITs that are constantly raising their rent. Larger and larger rent checks create growing dividend checks for us! 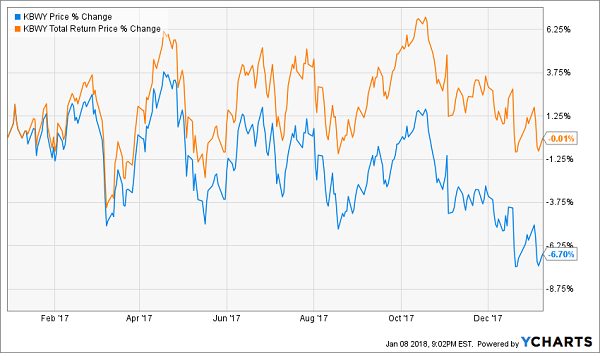 2017 wasn’t a fun year for REIT investors, with the Vanguard REIT ETF (VNQ) coming in essentially flat for the year without including dividends. But the real difference those payouts make can be seen in the PowerShares KBW Premium Yield Equity REIT Portfolio (KBWY), which focuses on midsize and smaller REITs. Without the hefty dividend, you were 7% in the red. With it, you at least managed to break even. That’s no small difference. While many REITs were busy struggling throughout 2017, logistics real estate play Prologis was soaring. The company – which specializes in warehouse and distribution centers – put up a 22% price gain versus the flat performance of the Vanguard REIT ETF (VNQ). And why not? E-commerce is king, and the growing industry – whether it’s internet operators or brick-and-mortar retailers trying to make the transition – needs more and more of these types of buildings to fuel an increasing number of online orders. Prologis now boasts 5,200 customers across 19 countries. The company has grown core funds from operations (FFO) – an important metric for gauging the financial health of REITs – from $1.94 per share to $2.14 through the first nine months of 2017. The company will announce fourth-quarter earnings in late January, but a dividend increase announcement likely will wait until sometime in the last week of February. This eclectic mix has largely been working for PS Business Parks, which has nearly quadrupled the VNQ over the past five years and outperformed it by 9 percentage points in 2017. That said, a strong start to the year started to fall apart in the final couple months in the year, sparked in part by a 4.9% decline in FFO and a small slip in occupancy for its third quarter. 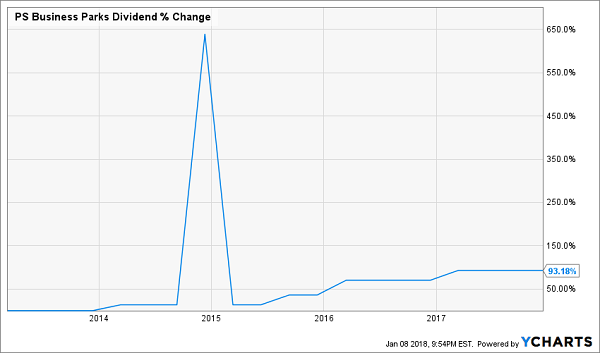 PSB has been a dividend-growing machine, however, charging its payout by 93% since 2013 to its current 85-cent quarterly distribution – and throwing in a big $2.75-per-share special dividend in 2014. Investors are likely to hear about the next improvement to the dividend sometime in the back half of February. First Industrial Realty Trust (FR) is another prolific dividend raiser, having pumped up its quarterly payout by nearly 150% since 2013. FR has been able to do that thanks to its growth-engine business, which is composed of national and regional distribution centers, light industrial buildings and R&D land. Meanwhile, FR also offers property management services, and occasionally sells properties to companies that prefer to own rather than lease. Combined, those properties boast a 97.2% occupancy rate as of the end of the third quarter – up from 95.4% at the same time last year, thanks in large part to building sales. “The U.S. industrial real estate market continues to enjoy broad-based tenant demand which has resulted in low vacancy rates and increasing market rents,” CEO Peter E. Baccile said in the company’s Q3 report, which included an 11% jump in FFO. Another dividend hike should be in the cards for First Industrial. If so, investors will get word in the latter half of the month. Data center REIT CyrusOne (CONE) had a boffo 2017, delivering 28% price appreciation in addition to its modest dividend, which should get a touch-up in late February. 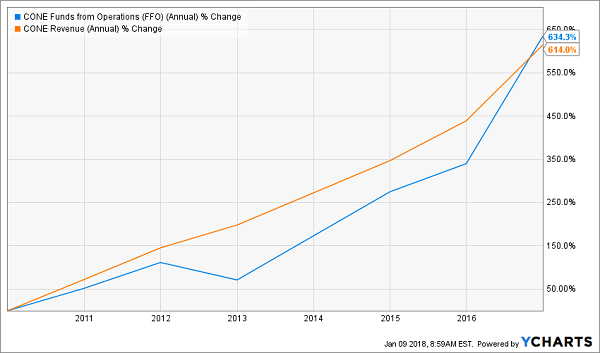 The REIT’s own operations are doing just fine, too, with normalized FFO per share rocketing 18% higher year-over-year to 79 cents in the most recent quarter, on a 22% top-line improvement. Ryman Hospitality Properties (RHP) is squarely in the crosshairs of the “experience economy,” boasting convention centers and resorts in Washington, D.C.; Dallas, Orlando and Nashville, not to mention the Grand Ole Opry and Ryman Auditorium. The hurricanes that ripped through the Southeast took its toll on Ryman, with third quarter revenues off 2.6% year-over-year, and FFO taking a 14% hit – bad enough to take FFO negative for the nine months ended in September. Nonetheless, investors spent the last quarter of the year bidding RHP higher. Despite the company’s struggles, a dividend increase should be in the offing. But investors likely will have to wait until the end of the month to find out. National Health Investors (NHI) is a consistent dividend grower that has upped the ante for 15 straight years, including a 7.7% annualized rate over the past half-decade. National Health Investors provides financing of senior housing and medical investments across a wide range of properties, including skilled nursing facilities, assisted care communities and medical office buildings, among others. NHI boasts 216 properties across 34 operating partners in 32 states. The company’s shares struggled in 2017, though the company put up a strong operational performance in its final report of the year. Third-quarter revenues shot up 13%, driving FFO growth of 11% to $1.35 per share – enough to cover its 95-cent dividend by 142%. Thus, investors can feel good about another dividend hike coming sometime in the middle of February. Armada Hoffler is an East Coast-based REIT that operates primarily around Washington, D.C., Baltimore and Coastal Virginia and the Carolinas. It’s also particularly diverse, owning and operating Class A office properties, mixed-use retail and Class A multifamily properties, which includes student housing. Retail (45%) is the largest chunk of the company’s net operating income, with mixed-use retail another 15%. That exposure to retail hampered it somewhat in 2017, though it did stage a rally in the year’s final months. That was helped out by its third-quarter earnings report, in which Armada raised its 2017 full-year guidance, now expecting 98 cents to $1 per share in normalized FFO, up from 97 to 99 cents previously. Technically, AHH has more than doubled its dividend from the original 8-cent payout following its 2013 IPO, but the lion’s share of that was done the same year, when it bumped the dividend to 16 cents per share. Armada is only up to 19 cents quarterly since then – good for just a 76% FFO payout ratio on the high end of 2017’s guidance. But investors certainly will be hoping for a bit more when the company delivers its next expected hike, likely sometime in the first week of February. The key to dividend growth investing is the velocity in which the payout increases. The faster the dividend doubles, the faster the stock price can double. It’s that simple. 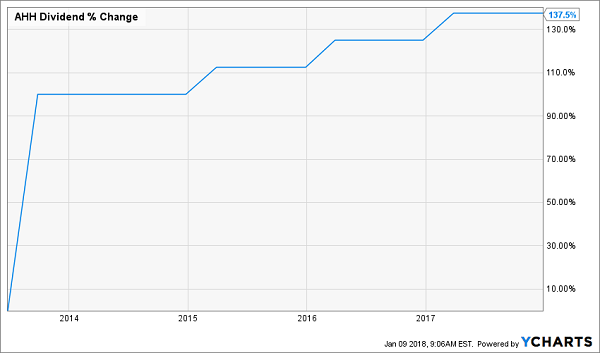 So if you want to make money with dividend growth stocks, it’s easy to build a portfolio that makes 10%, 15% or 20% or more every single year. You simply buy the dividends that are growing the fastest. If you achieve returns of 27.1%, you’ll double your money in less than three years. So if you haven’t been following this strategy, why not? The best time to get started is right now – before the seven dividend growers I mentioned begin to move. Click here and I’ll share their names, tickers and buy prices with you right now.